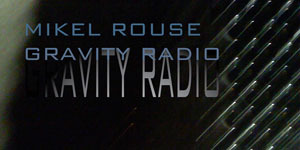 AVL multimedia specialist Jeff Carpenter transformed composer, director, performer, and recording artist Mikel Rouse's found video into a projection background for “Gravity Radio,” Rouse's latest touring performance. After a test run in New Orleans, Rouse brought the show to the Studio Theater in Krannert Center for the Performing Arts (Friday and Saturday, January 29 and 30, 2010). Gravity Radio is a "multimedia fusion of song cycle, news reporting voiceover, radio static, and experimental video collage." This is the second collaboration for Carpenter and Rouse (the first, in 2005, was for the world premier of The End of Cinematics, which was also performed at KCPA). Carpenter and Rouse will discuss their collaboration in the 2010 annual HASTAC Conference's arts program (all virtual this year, for the first time), which is chaired by AVL Director Donna Cox in her capacity as Director of the eDream Institute. The clip below gives the flavor of the Gravity Radio project, but does not show the video work that accompanies its live performance. The album is available through iTunes.